Are you happy? Have you made someone else happy recently? Happy is a word that is loosely thrown about. Recently I’ve learned a couple things about happy. The businesses that had teams run in the Livin’ Green race seemed happy. Bank of the Panhandle, Guymon Physical Therapy and Wellness, Tri – County Electric, and Urban Bru all had people smiling as they prepared to run. Were they happy because they were supported by their employers? Were they happy because they were doing something with friends? And maybe they were just happy when it was over. But they seemed happy. Jada Breeden recently put on the Total Living Show with her fellow Lions. Jada was happy she had bought some shoes at Merle Norman before the show that had memory foam in them. Not only was Jada happy, her feet were, too. She also said it was a very happy experience sitting in the massage chair Reid Furniture brought. I’m going to have to go check that out. She said if you have poor circulation, you really need to go take a look at it. They also found that people who watch more television are less satisfied with their lives than people who watch less. Their explanation is “mainly because TV takes us away from other people …. Social relationships are emerging as the foundation of happiness. In another study, when people received a gift certificate with instructions to spend it on either themselves or someone else, people who’d spent the money on others were measurably happier than those who hadn’t. The ones who were happiest were those who bought a coffee for someone and spent time with that person. Who should you have a cup of coffee with? Why put it off? Think you could improve your social interaction? Consider joining a civic group. Consider volunteering for some of our community activities. Join a Bible study. Join a zumba or spinning or ceramics or bridge group. Step out and make a move towards more happiness. What would you enjoy? What would you like to try? Name your experience and get a move on it. “We must use time wisely and forever realize that the time is always ripe to do right,” said Nelson Mandela. Don’t waste your time, do something that matters to someone else. He also said, “Man’s goodness is a flame that can be hidden but never extinguished.” Fuel your flame. Do something for someone else. Don’t know what you want to do? Call me. I’ll probably tell you what to do … and where to go. I’m smiling as I add “in a good way.” Number is 338-6246. Take responsibility for your own happiness. It is not someone else’s job to make sure you’re content in life. Only you can do that. If there need to be changes, take them one step at a time. Just do something. 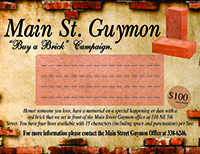 See your happy self on the bricks!